This year, on Valentine's Day, our kendoists chose to spend it doing what they love, practicing Kendo with the 40+ members of the Nippon Sports Science University's Kendo Club (日本体育大学), led by Yagisawa sensei, 8-dan Kendo. Nippon Sports Science University, or Nittaidai for short, were in Singapore for a cultural exchange and demonstration, in conjunction with the 50th Anniversary of Singapore-Japan Diplomatic Relations (SJ50). The godokeiko, kendo seminar and shiai-keiko on Sunday followed the "Traditional Cultural Exchange Training" that was held on Saturday wherein other martial arts groups like Judo, Karate and even Sumo was demonstrated to a receptive audience at the Changi Japanese School. 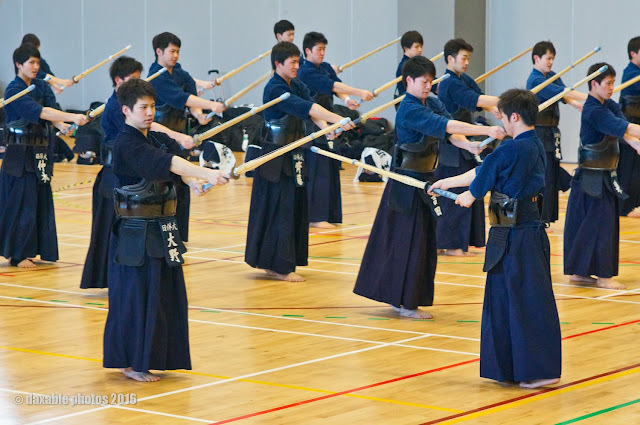 One of the highlights for us kendoists, was the way in which their suburi was demonstrated - perfectly synchronized and utterly spell-binding to watch. - the commencement of cuts are synchronous with the Captain's commands (even during hayasuburi). Damian sensei pointed out something that we may not have noticed with our eyes: a large part of why they could do what they did, was a result of each student calling themselves a part of "Nittaidai", an identity that was bigger than any single one of them. Having this identity, and belonging to something larger than themselves, can actually empower individuals to perform even better than they possibly can alone. As kendoists in Singapore, we may hail from different local dojos, but whether we come from NUS, NYP or SKC, in the end, we all practice Kendo in Singapore. This identity and belonging should all inspire us towards higher levels of Kendo, even if it is as simple as doing our warm-up suburi in perfect unison. When we go out to other parts of the world, remember that we are from Singapore, and wear it like a badge of honour. Thank you Nittaidai, and we look forward to seeing you again next year. Thanks to Stella Wong for the video taken of the Nittaidai suburi. For more pictures taken during the second session of the event, please see this gallery. Eugene Chow - for the meal arrangements. Grace Lim - gifts for our guests. Ching-Hui Teo - for the administration support. Cheryl Sng - for administration and refreshment support. Kaori Klismith - for hosting the dinner in a very nice environment. Jan Rod - for assisting us by booking and ensuring that we had a good venue for keiko and lunch. Kenji Inoue - for the translation which made communications much easier. Damian Carmody-Stephens - for his knowledge and experience with Nittaidai. And Emilie Dion for taking her time for helping with the fruits for lunch. Thanks also to all of the senseis who attended the sessions and rendered their support.